Former Marine Sgt. 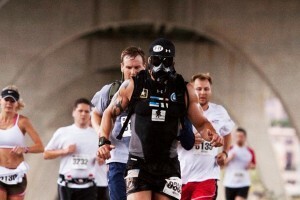 Jeremy Soles made history on Sunday when he set a Guinness World Record for running the entire 26.2-mile Marine Corps marathon while wearing a gas mask in an unofficial time of 4 hours, 29 minutes and 2 seconds. Soles, founder of the nonprofit group Team X-T.R.E.M.E., dedicated his achievement to Marine Cpl. John Michael Peck, who suffered traumatic brain injury in Iraq in 2007 but insisted on returning to combat, only to lose both arms and legs in a roadside bomb attack in Afghanistan in May. “He embodies everything that Team X-T.R.E.M.E is about: Overcoming mental and physical obstacles,” Soles said in a phone interview on Monday. Sunday’s event was the culmination of two years of conditioning and training. The gas mask restricts his breathing by about 25 percent, and all the gear associated with the mask weighs 15 pounds. Soles met Peck about a month ago during a visit to Walter Reed Army Medical Center while looking for a wounded warrior to whom he could dedicate his record-setting run. Peck was waiting for Soles when he crossed the finish line on Sunday. Afterward, Soles came over and gave his wounded comrade a smart salute. “Corporal Peck, you are my hero,” Soles said. I cannot even begin to fathom the the difficulty of doing something like this. I wish I had something to add beyond what I cut-n-pasted above. I just don’t. I’m blown away by the drive and discipline and willpower it takes to do something like this. But I’m equally blown away by the man to whom this run was dedicated. In the wake of recent elections, I think that doing something like this should be way more important than spending absurd amounts of money on negative campaign ads. You want to be a senator? Do something remarkable for someone else. Do something like Sgt. Soles just did. It’s amazing the power of someone who can shut up and do something instead of just talking about doing something (and then likely not actually ever doing it). Sgt Soles, if you ever run for election somewhere that I can vote for you, you have my vote. Sgt. JS, you are a BAMF! When I saw this article on ST one of the 1st thoughts that came to my head was “BAMF” and the picture certainly adds an exclamation point. Here is a link with more pictures including the salute to Cpl. Peck. Jeremy is an amazing man, and he and his organization traise money and awerness for all our men and women injured in combat. Team EXTREME is one of the most honest and worthwhile organizations I have ever had the chance to donate to, and i will continue to donate to Jeremy, TEam EXTREME and the Wounded Warrior Project! Way to go Jeremy and a huge thank you to all the men and women that serve this country including my fiance! Thanks for your post on SGT SOLES and CPL PECK. Thanks for sharing this Jordan! Sick, just sick stuff. The pictures Andy posted, especially the salute pic, really drive it all home.